I love baked macaroni and cheese, but what kid doesn’t? And if I had a dime for every family restaurant I ate at what is on the children’s’ menu? You guessed it, Macaroni and cheese. So while cruising through the Cape Cod Times I came across (you guessed it) one of my favorite pasta recipes that resonates throughout our family and probably is one of your favorites too. We never have anyone say they do not like our baked macaroni with cheese regardless of how it turns out. Chris and I aspire to make it a little different each time. However, this recipe, while not an easy everyday cooking recipe, still is a dish that can be prepared in advance and served either as a side or a main meal and… has our taste buds on high alert with our mouths watering, so enjoy...compliments of the Associated Press. The recipe calls for a 3-quart casserole dish, but several smaller dishes could be used. Heat the oven to broil. Use 1 tablespoon of butter to coat a 3-quart casserole dish. Bring 6 quarts of water to a boil in a large stockpot. Add 2 tablespoons of salt, stir briefly, then add the pasta. Cook until tender and just past aldente, about 10 to 13 minutes, or slightly longer than directions. Drain the pasta, then transfer it to a large bowl. Drizzle the olive oil over the pasta, then toss to coat. Set aside. To make the sauce, in a small saucepan over low heat, bring the milk to a simmer. Remove the pan from the heat. In a medium saucepan over medium, melt ½ cup of the remaining butter, using a whisk to swirl it to ensure the butter melts completely and does not turn brown. While whisking, slowly pour in the milk. Continue whisking until there are no lumps. Bring the sauce to a boil, then reduce heat to low and season with salt and pepper. Continue whisking until the sauce reaches the consistency of heavy cream and coats the back of a spoon, about 2 minutes. and a ½ cup of the Parmesan. Whisk until the cheese is completely melted and the sauce is smooth. Pour the sauce over the pasta and gently toss to coat. Transfer the pasta and sauce, using a rubber spatula to scrape the bowl, to the prepared casserole dish. Set aside. In a small microwave-safe bowl, melt the remaining 1 tablespoon of butter by microwaving on high for about 20 seconds. Add the breadcrumbs and remaining cheddar and Parmesan cheeses. Toss well. Spread breadcrumb mixture evenly over the pasta. Place the dish on the oven’s middle rack and broil for 6 to 8 minutes, or until edges are bubbly and a crunchy crust forms. There you have it! Baked macaroni and cheese! Use elbow macaroni – holds the cheese better. Cook the macaroni a just past al dente – makes the pasta absorbent and nothing is better than cheesy macaroni. Use whole warm milk – cold milk makes lumps when preparing your cheese blend. Toss dry bread crumbs in melted butter and some cheese before being added to the dish. And, as always, serve your favorite dish with a side of baked macaroni and cheese instead of potatoes! Look for a Cool Pan to Serve Your Macaroni and Cheese in. Serve up home made breads with this dish. 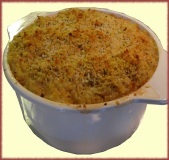 Return From Baked Macaroni and Cheese to Easy-Everyday-Cooking-Recipes.